Fiona — Piano. Push. Play. This year's contribution entitled “Heroes” is inspired by recently passed pop icons David Bowie and Prince. Featuring a glam-inspired David Bowie lightning bolt and purple Prince backgrounds, the piano is a tribute to two of Pop’s most influential cultural icons. The artist's representation uses mixed media; paper, wood, paint, sculpture, printmaking and fabric. Led by Tony M., Paige C., and Ron S., once again, Doug Fir is delighted to be a contributor to the Piano. Push. Play project. "Fiona Apple is an award-winning singer-songwriter whose self-confessional, literate albums routinely receive critical acclaim. 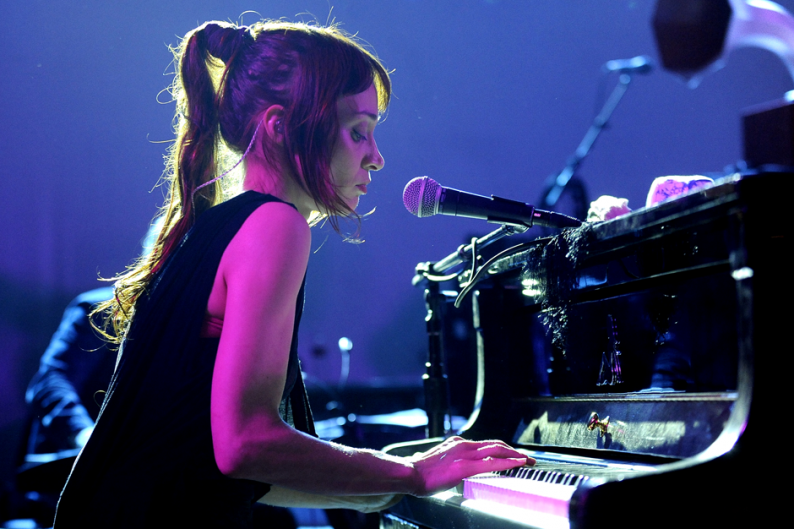 Born on September 13, 1977 in New York City, Fiona Apple is a singer-songwriter known for her husky voice and inventive, piano-driven music. Her 1996 debut album, Tidal, went multi-platinum and its single, "Criminal," earned Apple a Grammy. A sometimes controversial media figure, Apple has released several more acclaimed albums, including 2005's Extraordinary Machine, and sung on various collections."